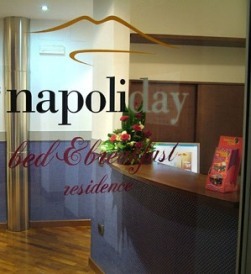 Napoliday is located in the heart of Naples City, in a luxury quarter of Chiaia, the most exciting and fashion area, where best restaurants and high fashion shops are concentrated, and within walking distance from the world-renowbed artistic and cultural attractiones of this magnificent city. Located close to the harbor it allows to organize suggestive trips to the most attractive towns of the region: Sorrento, Pompei, Capri, Ischia, Positano. Easy to reach from the train station and from the airport. 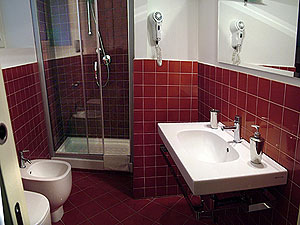 The B&B amenities include wireless internet connection in all rooms and common areas, parking with discount, reservation for restaurant, theater and museum, car rent, scooters, bikes and boats, and reservation for excursions and city tours. 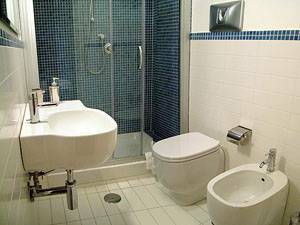 All rooms are elegant and spacious, furnished with style, creating a warm and confortable enviroment making very pleasant your staying in Naples. Reservation can be cancelled up to 3 (three) full days prior to arrival date. First night will be charged after this deadline or in case of no show. Take the Tangenziale and get out at the Fuorigrotta exit. Go ahead through Piazzale Tecchio and via Giulio Cesare. Pass through the galleria Posillipo (tunnel), go on by Via Caracciolo (seafront), piazza Vittoria, Riviera di Chiaia, Via Carducci, until Piazza dei Martiri and finally in Via S. M. Cappella Vecchia. Napoliday is at the stret number 11. From the airoport your can take the bus Alibus until Piazza Municipio and then the bus C25 until Piazza dei Martiri station.